Anthem of the Seas is Royal Caribbean's brand new cruise ship that is under construction and a member of the Quantum class of cruise ships. Anthem of the Seas will have her first cruise in spring 2015, with a homeport of Southampton in the summer and Fort Lauderdale in the winter. Royal Caribbean's Anthem of the Seas offer so much for guests to enjoy, but of all the experiences onboard, which one stands out as the best? Matt counts down his top seven experiences while he was onboard Anthem of the Seas to give you a look at what this new ship has to offer. Few innovations on Royal Caribbean's Anthem of the Seas are as impressive to look at and take part in, as the North Star. North Star is an observation pod that is attached to a giant arm on top of Quantum class ships, such as Anthem of the Seas. 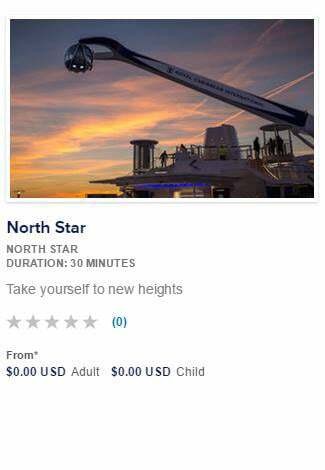 North Star takes guests 300 feet above sea level and gives them views that have never been available until now. Understandably, North Star is quite popular and long lines have been known to develop. Luckily, we have five secrets to share with you for the best possible experience! In general, you will find the shortest lines for North Star on days when your ship is docked in port. Since most guests are off the ship and exploring the port of call, there are far less guests to compete with. This means shorter lines compared to sea days. Lines may still exist on port days, but there tends to be ideal in the morning hours before many guests start returning to the ship after their shore excursions are complete. If you need the absolute, positively best time to go for a ride on North Star with short lines, go for the first ride of the day. Check your Cruise Compass for what time the first North Star ride will be, and then plan on arriving 10-15 minutes before that time to get in line. By arriving a little early, you will ensure a minimal wait. In fact, you will likely be in the first ride given most guests start arriving after the North Star star rides begin. While you are enjoying the amazing views from North Star, you can use Royal Caribbean's Voom high speed internet to share the experience with friends and family onboard. Just like anywhere else on your ship, Voom works throughout the entire experience, so feel free to post photos or video on your favorite social media networks or call someone on Facetime and share the experience live. Remember our first tip about there being shorter lines while your Royal Caribbean ship is in port? There is a small catch. While your ship is in port, North Star is restricted in how far it can go over the side of the ship. Experiencing North Star while in port is still a very fun experience, but keep in mind you will not move all the way over the side of the ship like you would while at sea. Recently, Royal Caribbean started allowing guests to book North Star rides online via the Cruise Planner. Once you have Anthem of the Seas (or any Quantum class ship) booked, log into your My Cruises section of Royal Caribbean's web site and head to the Cruise Planner. Look for activities under the Cruise Planner and you will spot North Star. With this option, you can assure yourself of a front-of-the-line spot to experience North Star. Are you excited to try North Star? Tell us about why in the comments! Get a behind-the-scenes look as Dancing with the Stars couples Carlos PenaVega & Witney Carson rehearse a dance from Anthem of the Seas' popular show “We Will Rock You” which they performed on a recent episode. While onboard they also explored the unique features of the new ship sailing out of the NY area. Royal Caribbean's Anthem of the Seas offers a lot of things to see and do onboard, and today we are highlighting one of the more impressive visual elements on this brand new ship, the Vistarama. Vistarama is a show in Two70, where Two70's iconic floor-to-celing glass windows are transformed into a "digital canvas", where pretty much any scene, real or imagined, can be displayed on them. Two70 is a two-deck high, multi-purpose entertainment venue is located at the rear of the ship. It features wraparound, floor-to-ceiling windows that give an amazing 270-degree view of the passing landscape. Check out this preview of Vistarama for a good example of what this show is all about. Royal Caribbean utilizes 12K resolution projects (that means it is 12 times high definition) and the result is some stunning views for guests to enjoy. Before the show starts, the sun shields that serve as the projection surfaces are rolled down to cover the windows. Eighteen projectors are used to create an ambient surface that is 120 feet wide by 23 feet tall, in a 5:1 aspect ratio. This is an industry first in terms of this kind of projection technology. The slope, curvature, and surface textures of the Vistarama system require the image content of the projections to be geometrically adapted to the circumstances. The result is a projection with a total resolution of 12,480 x 2,280 pixels and a projection size of 36 x 6 meters. The Vistarama show content was developed by Moment Factory, while the hardware set up was made possible by Amptown System Company. What are the Vistarama shows? Royal Caribbean routinely offers different kind of shows throughout any given Anthem of the Seas cruise and is regularly adding new ones with each new Quantum class ship launch. Why is Vistarama worth your time? What makes Vistarama so impressive a show is the visuals that can only be found here. Vistarama's ultra-high definition displays transform the entire Two70 space and it is one of those things you have to see to appreciate. Simply put, Vistarama is a stunning display that is as beautiful as it is immense in scale. 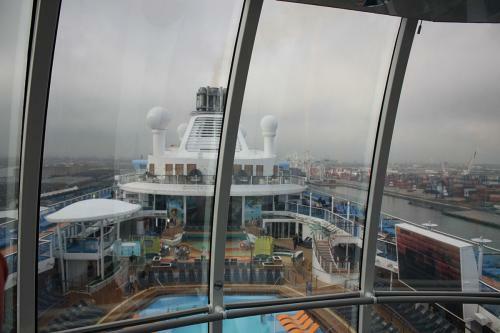 Perhaps no cruise ship other than Royal Caribbean’s Anthem of the Seas has garnered as much attention this year, and this week, I have returned from my 2-night adventure on Anthem of the Seas to share with you my entire experience. It was a terrific experience and it changed the way I look at the Quantum class ships. Let’s talk about the many experiences, dining, entertainment and everything else inbetween on this week’s episode. Take a look as Good Morning America's Ginger Zee and Rob Marciano tour the world's most advanced cruise ship. Royal Caribbean's Anthem of the Seas has a lot to offer, including a number of staterooms. Today, we will look at the category D3 balcony stateroom and take you through the cabin to give you an idea of what to expect if you book this category. On Anthem of the Seas, we reviewed stateroom 6266, which is located on Deck 6 forward, fairly close to the elevator bank. Entry to the room is by RFID scanner, which is above the door handle. A D3 stateroom features a full bathroom as well with stand up shower. At 55 square feet, the balcony is average for a Quantum class ship and it has enough room for two chairs and a table. It's enough space for two people to comfortably enjoy the view and ocean air. Royal Caribbean is proud to welcome Anthem of the Seas to her new homeport in Cape Liberty, NJ. Now anchored in America, Anthem of the Seas will provide New Yorkers with a new way to come seek adventure. “Dancing with the Stars” couples Carlos PenaVega & Witney Carson and Alek Skarlatos & Lindsay Arnold were recently onboard a 2-night sailing of Royal Caribbean's brand new ship, Anthem of the Seas. Anthem of the Seas recently arrived in the New York City area to begin offering cruises year-round to destinations in the Caribbean, Bermuda and Canada/New England. The couples were onboard to learn a dance from “We Will Rock You,” for the Nov. 9 episode of DWTS, airing 8/7 Central on ABC. The celebrities were spotted taking a ride in the North Star, skydiving at RipCord by iFly, riding bumper cars in SeaPlex and catching a wave on the FlowRider surf simulator. Royal Caribbean's Anthem of the Seas has arrived in New York Harbor and embarked upon her first sailing and already there is a ton of buzz surrounding this amazing new ship. Being the social media junkies that we are, we perused Twitter, Instagram and all points inbetween to find you the best photos so far from just the first day on Anthem of the Seas. Enjoying this view of the NYC skyline from the Solarium onboard #AnthemoftheSeas! Welcome to the U.S.A.
Want to see more? Be sure to follow our live coverage of Anthem of the Seas that begins tomorrow at http://anthemoftheseas.live!